We've finally gotten to our Thanksgiving crafts! 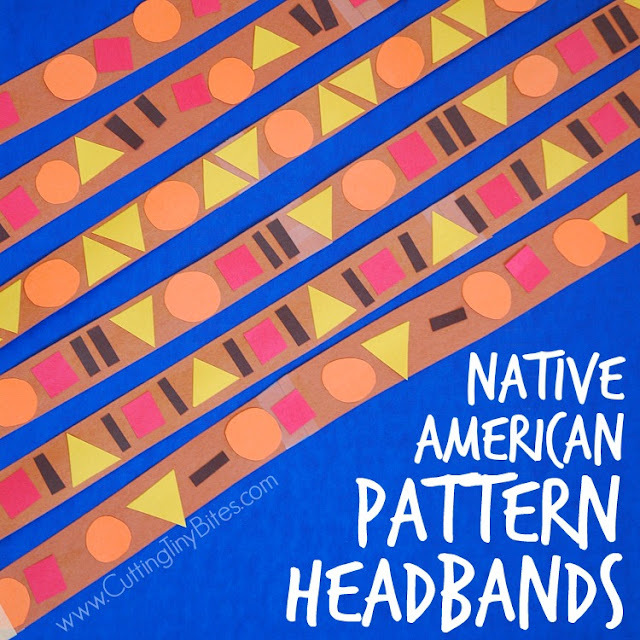 These Native American Pattern Headbands have it all-- colors, shapes, patterns, gluing, dress-up, and pretend play! They're also lots of fun, pretty, and easy to make. You'll need construction paper, scissors, Scotch tape, a glue stick, masking tape, a hole punch, and string or ribbon. 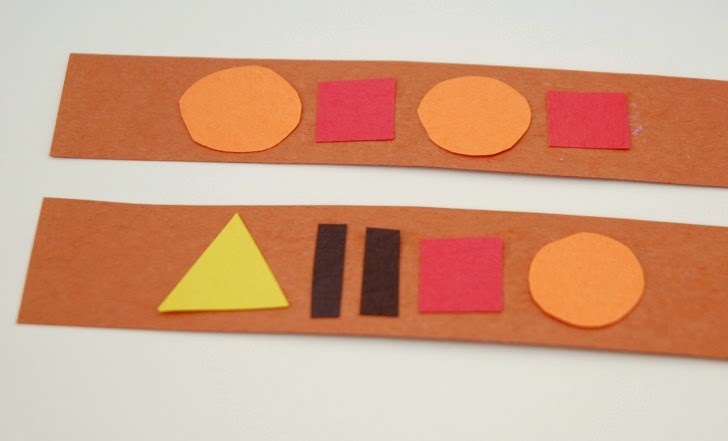 Cut brown construction paper into strips length-wise, about 1-inch wide. 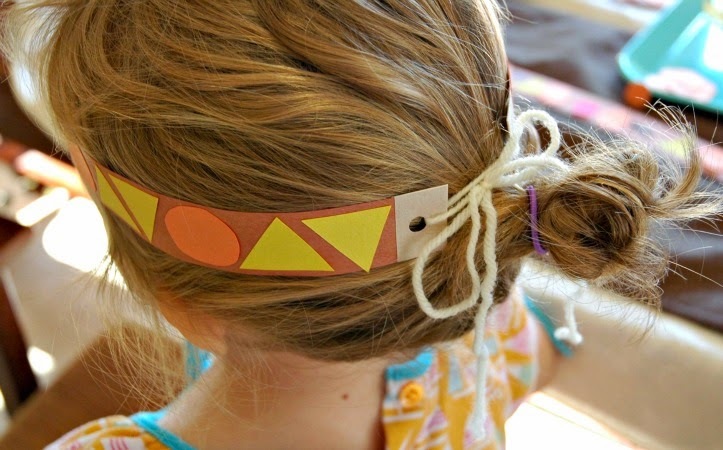 You'll need 2 strips for each headband you're making. Use Scotch tape to attach 2 strips together. 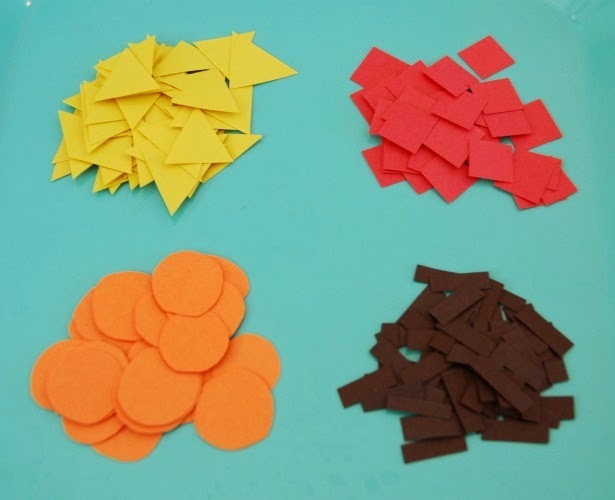 Cut shapes from red, orange, yellow, and black construction paper. I cut the same shape from each color (orange circles, black rectangles, etc.) so that my girls would only have one attribute to consider while patterning. 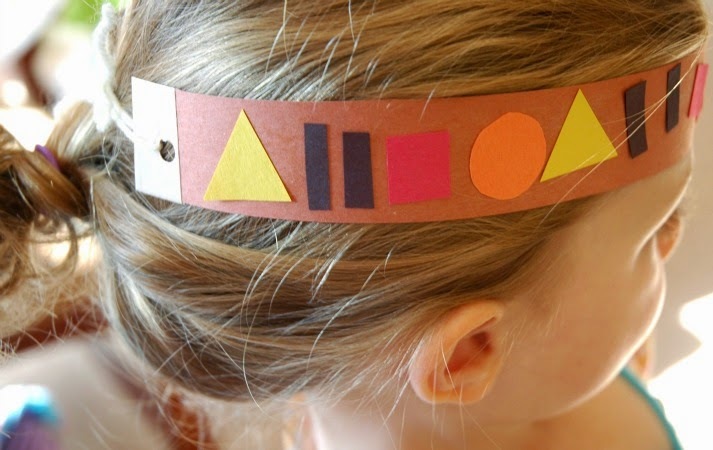 Start a pattern for your child, gluing the shapes onto the headband. I started a very simple ABAB pattern for Maggie and a more difficult pattern for Lena. Let your child continue the pattern until completed. Make the headband into a circle. You could just tape the ends together. I put a small piece of masking tape on each end to reinforce it, then punched a small hole in each side. Thread a piece of string through each hole, then tie a bow to tighten around your child's head. Using a string in this way makes it a little bit more adjustable and easy to get a good fit. All done! 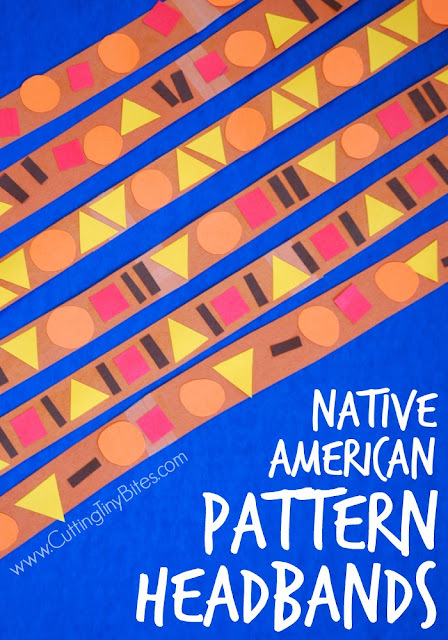 Make sure your child knows why we make Native American crafts as we celebrate Thanksgiving! 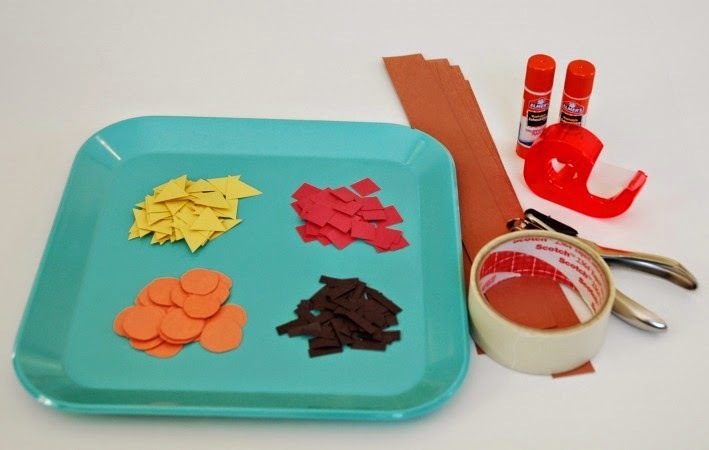 See lots more Thanksgiving crafts by following Cutting Tiny Bites on Pinterest, or by following the Thanksgiving Theme- Weekly Home Preschool board below. 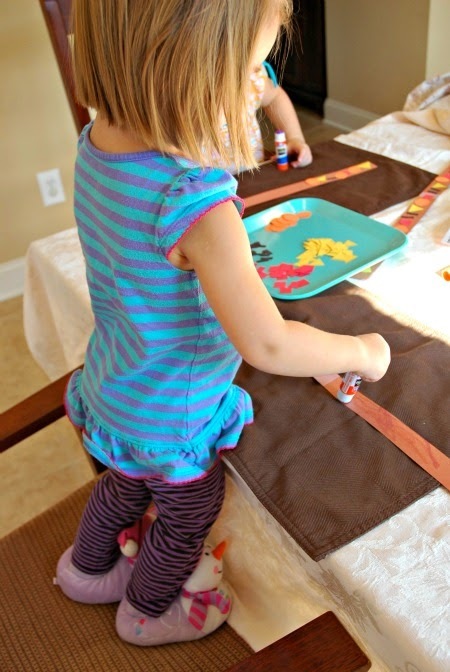 Thanksgiving craft for preschoolers or kindergartners. 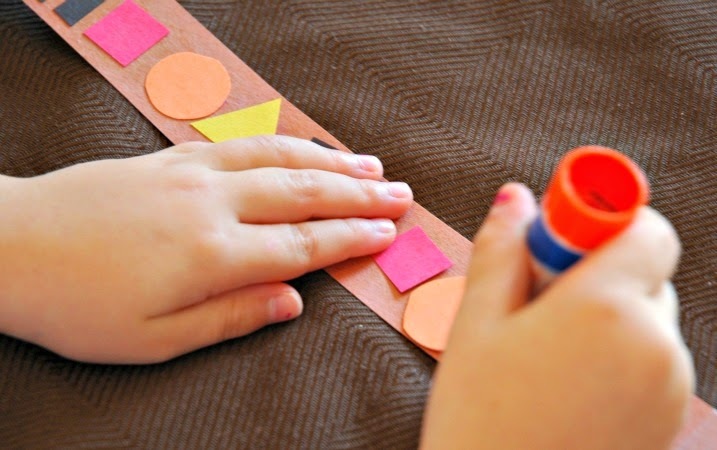 Colors, shapes, patterns, gluing, pretend play, and dress up! Great for older toddlers and preschoolers.